Just a quick post showing two new skirts I made with my go-to pattern Simplicity 2449 view B... because I can never have too many skirts with bats. :) Both are made of cotton so they're great for the upcoming summer weather. 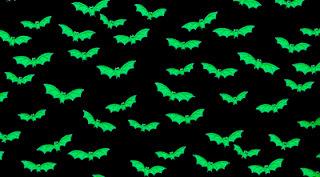 First up, black with a small-scale print of lime green bats. I bought this fabric last week at Jo-Ann (with a 40% off coupon, yay!). The fabric is darker than it looks in the photo. Second, a larger scale print of bats in black and grey. This fabric had been in my stash for so long, I can't remember where I got it. Anyone else have plans for summer sewing? YES! I have lots of sewing plans! I have the same fabric as the first photo and the plans are for a 50s sundress. I bought a bunch of reissued vintage patterns from Butterick and Vogue, so there will be sewing in my near future. I really love the print of the second skirt. VERY NICE!!! I adore the detailing around the hems of both! WAHOO! Vogue has some great vintage patterns. I planned a dress from the green bats, but I ran a trial with the dress pattern and it did not go well. :( So it was back to the drawing board for a dress, and in the meantime, a tried-and-true skirt. The grey bats fabric is one of my favorites. I wish I had more of it! Yay! All the bats! Love it! I have such a weakness for bat fabrics. Must have all the bat fabrics! I read your post with all the lovely prints and I felt an urge for lovely bat print skirts :) You are such an inspiration! Why? I had a mega melt down over a cut pattern, ready to sew, machine breaking=total chaos. Not the most mature moment more than 10 years ago. There are sewing meltdowns in my past as well. In fact, I got so frustrated that I gave up sewing for years. :P I didn't pick it back up until four or five years ago. Now it's one of my favorite hobbies. The first skirt makes me squee. I think I might have that fabric in my stash too. Yes, of course I have summer sewing plans! Next on the list is a Ms Pac-Man dress, followed by either a poison or Haunted Mansion dress. Ooh, Ms Pac-Man! :) That will be fun! These are cute! I'm sewing scarves and do-rags for my hair, and planning on making some mod-goth shift dresses. We just got a fabric store with walking distance of my house, and I've already spent way too much money there. Thank you! A fabric store within walking distance... ooh, now that is a dangerous thing! Okay, now you've done it... I'm a woman on a bats mission!! I've copied down the pattern info, I'll be going to Jo-Ann's really soon! I know I got one of their coupon postcards, but I think it's in the garbage, WAAHHHHH!!! Despair not! Jo-Ann almost always has a coupon at www.joann.com/coupon, usually for 40% off one regular price item. You can print or send it to your smartphone. We used to have a Jo-Ann's just a few minutes from my house, but they moved, very rude of them... Now I have to drive to another city to shop there! Annoying, but easier on the pocketbook. And you're right, this pattern in all its variations, is awesome!!! It would be perfect for a head scarf for you! Both skirts are so cute! I like the big bats the best I think. Thank you! I wish I had more of the grey bats fabric.